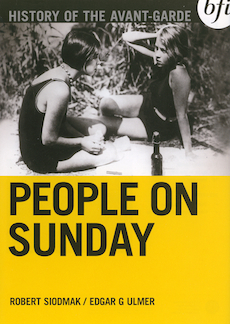 A tale of five young Berliners, a taxi driver, a travelling wine dealer, a record shop sales girl, a film extra and a model, on a typical Sunday. A tale of five young Berliners – a taxi driver, a travelling wine dealer, a record shop sales girl, a film extra and a model – on a typical Sunday. In this vivid snapshot of Berlin life, a trip to the countryside reveals the flirtations, rivalries, jealousies, and petty irritations common to any group outing. All too soon it is the end of the day, and the prospect of Monday looms, and the return to the weekday routine. People on Sunday marked the start of the film careers of six cineastes who would go on to great international successes: Billy Wilder, Robert and Curt Siodmak, Edgar G Ulmer, Eugen Schüfftan and Fred Zinneman. This restored version has been reconstructed by the Netherlands Film Museum and contains important scenes previously missing. This version also features a vibrant new score by Elena Kats-Cherin.